The most European city in Russia is without a doubt the beautiful St. Petersburg, and on top of this, it is the home of some of the most interesting bands that came forward out of this gigantic country. Menzoberranzan and Dark Predestination are two of those bands that bring a wonderful mix of classical music and bombastic dark metal, and you can also add this Aryavarta to this list. What's remarkable about these three is that they are linked by common band members, which already says much about the almost infinite creativity and musical capacities of these gentlemen. With "The sign of the times" they score yet again high and I hope their label is able to use European distribution channels, because this is really very high quality! The duo Veromir Silvenwind (Song, keyboards and orchestration, base) and Aldogor (guitar, keyboards, base) will make you wonder why no one ever heard of them, because, although their music is very difficult to describe, you are swept away from the beginning to the end by this epic. Veromir's epic, story-telling, singing style gives a very special feeling to the songs, but in between these meditating, dreaming passages, which are accompanied by melancholic guitar and keyboard work, the music often goes suddenly in a completely different direction. The tempo is slightly fastened, the guitars become heavier, and before you know it there is a grunt which reminds you of "Septic Flesh". Perfect thus, to flare up the darkness. The keyboard lines give a soundtrack like effect and sound very modern, but then they suddenly move to classic and Prokofiev appears. There's no lack of variation thus. That is off course necessary when you see that the songs last between 6 and 12 minutes. Pure fantasy lyrics are mixed with peaces of Sumerian Mythology and the lyrics are added both in English and in Russian so that everyone can understand. Add to that the super clear production that, despite of the underground character of the record, is very professional and nothing can spoil your enjoyment. 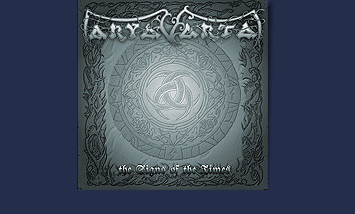 We only received the order info in Russian, so if you are justly curious, go check their website www.aryavarta.net for more details. You will not be disappointed.